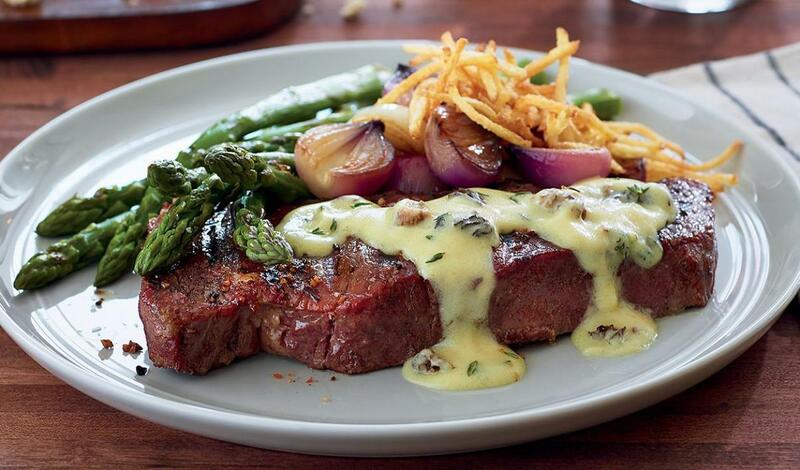 Pair the New York strip with a sauce made from onions, garlic, morel mushrooms, thyme and white wine. Complement the dish with a side of grilled asparagus, baby onions and a shoestring fries. Rub steaks with oil, salt and pepper. Arrange steak on a plate with desired sides, slicing before plating, if desired. Spoon sauce (sub recipe below) over steak and serve. Consider complementing your dish with a side of grilled asparagus, baby onions and a shoestring fries. While the steak rests, add extra virgin olive oil to the pan. Add onions and mushrooms and cook until onions begin to caramelize. Add the garlic and thyme, cook a minute more. Deglaze the pan with white wine. Reduce by ¾. Add the prepared Knorr® Classic Hollandaise Sauce and season to taste with lemon juice and salt. Spoon sauce over steak and serve.